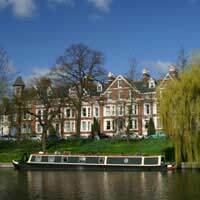 With more canals per square mile than any other European country, Great Britain is a haven for waterway lovers, both visitors and those who live afloat. Britain’s 200-year-old, 2,200-mile network of canals and rivers has undergone a dramatic revival in fortunes since the middle of last century when all but a few enthusiasts regarded canals as little more than health and safety hazards. Today its popularity as a recreational haven is booming, with reports of over 260 million visits to its waters each year by anglers, walkers, cyclists and nature lovers. The waterway rebirth has not only transformed the tourism industry but also the local surroundings, breathing new life into waterside towns and cities. Besides creating jobs, promoting waterside regeneration, improving biodiversity and pumping tourist monies into local economies - it is estimated that visitors to the canals spend almost £1 billion in local communities each year - the canals are also now being rightly championed as one of the most significant examples of industrial heritage anywhere on the planet. British waterways are also home to over a thousand wildlife conservation sites and the UK’s third largest collection of listed structures – including thousands of locks, aqueducts and bridges. Not only are people holidaying around waterways in greater numbers but enjoying the lifestyle afloat too. Last year holidaymakers spent 800,000 nights aboard hire boats. Some love the buoyant lifestyle so much they have gone the whole hog and adopted a boat as their permanent residence. In amongst the 32,000 boats afloat – more than at the height of the Industrial Revolution - there are now over 15,000 people that class themselves as ‘liveaboards’. Liveaboards can be found all across Britain’s canal and river network, as well as along its coastline. Their vessels are moored in cities, in the country, and in harbours. They might live in narrowboats, or sea-faring craft, or static houseboats. Whereas some liveaboards are permanently moored in one spot, others cruise continuously (‘continuous cruisers’), while others enjoy a lifestyle that mixes the two together. The people that choose to live on the water are far from being a particular type of person. Liveaboards are a diverse bunch, which come from all walks of life, from young families to retirees, professionals to artists to boatbuilders. The attractions of living on a boat are equally varied. They might be drawn by the nautical life or the closeness to nature. Others love the camaraderie and community amongst boat dwellers. Some just want to escape the day-to-day stresses of the modern world ashore. Those liveaboards that choose the nomadic lifestyle of the continuous cruiser are a breed unto themselves. It demands a certain mentality to enjoy living a life constantly on the move, never staying in one place for more than a couple of weeks. It’s not surprising then that continuous cruisers are a minority group - according to recent British Waterways, there are only 2175 registered cruisers roaming the network. The surge in popularity of canals for recreation can be traced back to one date. 25 October, 1968, is seen as one of the most important moments in the history of British canals because it was then that a piece of government legislation was introduced that effectively transformed an all but abandoned Georgian transport network into a booming tourist industry. Prior to that pivotal date, commercial boat traffic on the canals had all but ceased, and the waterways had devolved into overgrown ditches. However, encouraged by enthusiasts and campaigning groups, Harold Wilson’s Labour government recognised the vital role that the waterways had to play in tourism and leisure, and introduced the 1968 Transport Act that secured the future of this valuable asset for future generations. Since 1968, the canal network has expanded by more than 20 per cent and there is now three times the number of boats on its waters. Maintaining this vast and well used network of canals and rivers is a costly business, estimated at amounting to over £100m a year. Some of this money is provided by government, but £20m of it has to be raised through a licence fee. This varies depending on the length of the craft, but is typically around £600 a year. This fee gives licence-holders access to fresh water and sewage-disposal stations. @toddy - It's a great life if you can afford it, but be prepared to pay hefty marina and mooring fees. But if you can buy a boat outright the fees are no more expensive than renting a property. Rob. hi my name is jim.-me and my partner salah (he's moroccan ) we are a male-gay-couple., are thinking of buying a houseboat for around £50,000. when we re-locate to the uk from turkey/morocco. my question is....... would i be able to claim my government entitlements? living on a house-boat? if anyone knows the answer to this,i would much appreciate it. thanks.